Before buying wine production software, here’s what you need to know. Wine production software can be your #1 tool when it comes to streamlining the winemaking process, but not all software is alike. 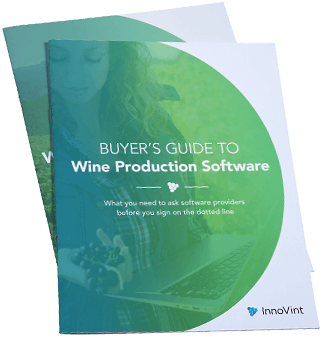 In our Buyer’s Guide to Wine Production Software, you’ll learn how to vet providers and determine which software is the right fit for your winery. Questions to Ask the ProviderDon’t take the sales pitch at face value. Find out the important questions you should ask a software provider to see if they can really deliver on your individual needs. Questions to Ask YourselfAre you a good candidate for wine production software? This guide will help you with an internal assessment to identify your biggest priorities, and how wine production software can help. How to Tell the Good from the BadWhen considering software providers, there may be issues you haven’t thought about, including security, support, implementation and more. Learn all the traits you should look for in a potential partner before signing on the dotted line.